Phantoms forward Nathan Pollard faces a frantic dash by rail and road to be part of the club’s big NIHL Autumn Cup semi-final showdown tomorrow night. Pollard is required to attend a work meeting in Central London which is scheduled to finish around 5pm. 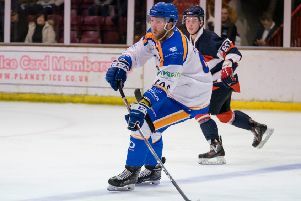 He must then make his way across the capital to Paddington before jumping on a train to Swindon - a journey of almost an hour - and finally completing his trek by taxi from Swindon Station to The Link Centre in time for a 7.30pm face-off against the Wildcats. “It’s going to be tight,” said Pollard, who helped Phantoms triumph 4-3 in the first leg at Planet Ice last Friday. “I’ll probably get there after the warm-up is done, but I definitely wouldn’t want to miss a game of this magnitude. “My meeting should finish at 5pm and then it’s a case of jumping on the tube from Old Street round to Paddington, which is 13 stops. “It’s then 57 minutes on the train down to Paddington and another 15 minutes in a cab down to the rink. “I’m hoping for a clear run and to be there by 7pm, but it’s going to feel very strange as I usually have a strict pre-game routine. Pollard has been an impressive performer during Phantoms’ 11-game winning run. He has contributed three goals along the way and formed a useful alliance with linemates James White and Will Weldon. Pollard added: “I’m feeling good. I worked hard in the summer and I’m enjoying being part of a team that is performing well. “Slava has put a lot of trust in me and I’m lucky to play on a line with two great guys in Whitey who is absolutely flying and Welds who is so smart on the puck. “Confidence is high in the dressing room and we all want to keep the winning streak going for as long as possible.